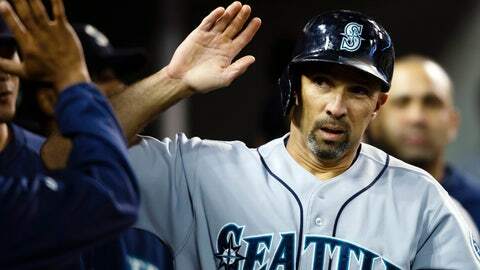 Raul Ibanez was signed to fill the void at designated hitter after Mark Trumbo was sent to the Arizona Diamondbacks in a three-team trade. Newly signed Angels designated hitter Raul Ibanez had a couple of interesting things to say Monday during a conference call with reporters, including why he slumped so badly in the second half of last season with the Seattle Mariners. "I basically stunk in the second half," he said, laughing. "I’m moving on from that." The 41-year-old Ibanez officially joined the Angels on Friday after passing a physical. He’ll receive a base salary of $2.75 million on a one-year deal and could receive another $2.25 million in incentives. Ibanez was signed to fill the void at DH after Mark Trumbo was sent to the Arizona Diamondbacks in a three-team trade. Ibanez hit 29 home runs last season, tying Ted Williams’ record for most homers by a player in his 40s, but he hit just .203 with five homers in the second half. Part of the reason for his slump may have been the fact he played more than 830 innings in left field last season. He’s expected to be used almost exclusively as a DH in 2014. I fully expect to perform at a high level next year. Asked about the reasons for his second-half slide, Ibanez said, "I don’t think about it. The stuff I really think about is what went wrong and how am I going to fix that and what I’m going to do next time. That’s really where I am about it. "I didn’t swing the bat the way I wanted to during the second half, and there’s some adjustments and things I’m (working on) now during the offseason, but I fully expect to perform at a high level next year." Ibanez is a career .349 hitter at Angel Stadium. In 18 years in the big leagues, he has played for the Mariners (twice), Kansas City Royals, Philadelphia Phillies and New York Yankees. Despite his age, he apparently doesn’t have any plans for retirement, he said. "How many more years do I want to play?" he said. "I literally go year by year and day by day…I still have the passion and the drive and the will to compete at a high level. If we win the World Series this year, then we’ll talk about it again at the end of the year."